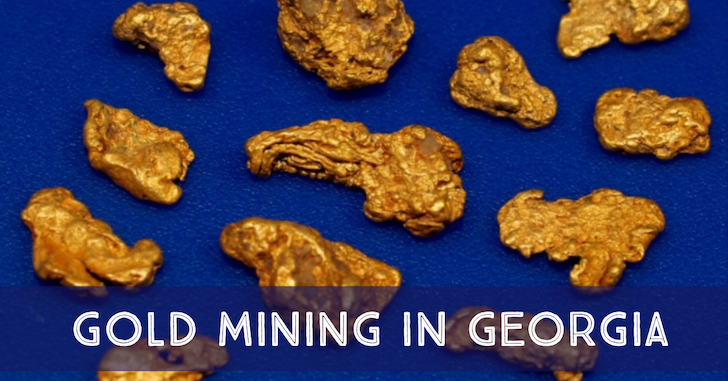 Georgia has one of the most significant gold occurrences in the eastern U.S., with many thousands of ounces of gold to its credit. Gold was first discovered here in 1828, although many reports claim that native Indians and earlier Spanish explorers may have had knowledge of gold prior. 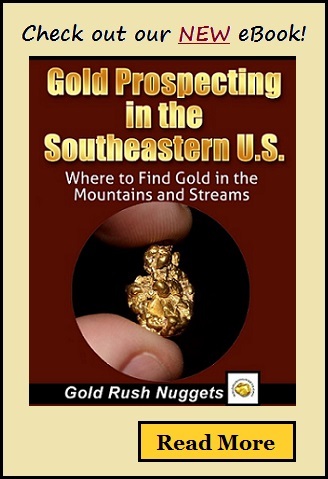 After the initial discovery of gold in North Carolina, prospectors exploring nearby states stumbled upon rich gold deposits near Dahlonega in Lumpkin County, and throughout the north Georgia mountains. 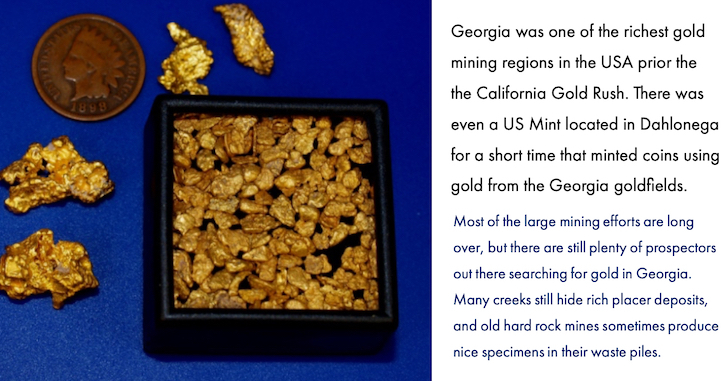 The early prospectors mined gold in Georgia for several decades, until the rich discoveries in California attracted most men west in search of gold. Georgia still has excellent gold mining opportunities today. Gold in Georgia is found in what is known as the Georgia Gold Belt, a region in the northwestern part of the state that has produced the vast majority of the gold in the state. The belt spans numerous counties, and we will highlight a few of the richest ones below. Lumpkin County was the area that gold was first discovered here, and the creeks and rivers still have plenty of gold to be recovered. The Chestatee River had numerous mines along its banks, with rich placer gold deposits found throughout. The Etowah River is another great place to explore, and the smaller creeks and tributaries in this area are all likely to have gold. The nearby Tesnatee River is also a reliable producer of gold. Remember that nearly 200 years ago there were thousands of men working these waters, so look for areas that show signs of old working; tailing piles, hand stacked rocks, and old mining “junk”. These areas that were previously worked by the old-timers are still going to have gold today. Nearby White County also has rich gold throughout its waters. The Chattahoochee and Nacoochee Rivers both have good gold, as well as various smaller creeks throughout the county. Dukes creek has several historic reports of very large nuggets being found. 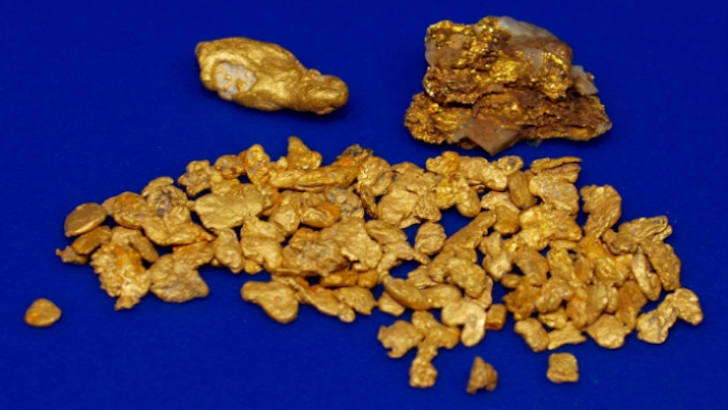 Many good gold placer deposits can also be found in Cherokee County. The Cherokee and Sixes Mines were both productive lode mines in the county, and gold can also be found in the Etowah and Little Rivers. Additional areas worthy of investigation in this general area include Dawkins, Pickens, Forsythe, and Paulding Counties. Each has produced plenty of gold, but don’t limit yourself to just the best known areas, as there have been placer gold producing areas found throughout the Georgia gold best. As with most areas, the majority of gold found is very fine, but nice chunky gold can also be found here. Suction dredging can be a great way to move lots of material and recover good quantities of gold. Additionally, it may be worth investigating areas that show signs of old hydraulic operations, as many areas were mined this way in the early days. There are also good amounts of old lode mines scattered throughout the region that may still be productive. Using metal detectors to explore these areas may be worthwhile. Nearly all of the richest gold bearing areas are located on private lands, so proper research and contacting landowners for access will be necessary to access some of the best gold grounds. Another fantastic option for a beginning prospector would be to join a local club, which will help you gain access to areas to work. Georgia has a rich mining history and great opportunities, and along with that are clubs that are more than willing to help out beginner prospectors. This is a great way to get started in the hobby, regardless of the state that you live in.